At work someone mentioned using a robot to distribute the Friday afternoon sweeties and I accepted the challenge. Already having a tank remotely controlled with a PS3 Controller I decided it would need a camera to see where it’s going. Having recently upgraded my phone I was able to use the old one with IP Webcam to share the camera feed over wifi. When I stumbled upon a brief article on Let’s Make Robots about a LEGO robot with a wifi camera which is controlled by a custom Android App. I followed the instructions on the website linked in the article and had the proof of concept up and running with the free version of the app. Upon buying the Pro version of the app I was able to drive the tank around via bluetooth and simultaneously see the camera footage from the old phone over WiFi. My configuration takes a Heng Long 1:32 scale Bulldog Tank base (chassis, motors, gearbox and treads) driven by a Dagu 4-channel motor controller (over the top in this instance but a common item now found in three of my robots) and controlled by an Arduino MEGA ADK (also over the top but I was using this for the USB Host aspect when the tank was operated by PS3 controller via bluetooth dongle). The bluetooth dongle has been replaced with a Bluetooth module for a simple serial link. The Bluetooth module I have is only identified by the following address written on the back http://shop34694757.taobao.com/ and the label BT_Board v1.1. Thankfully I didn’t need to do much to make it work, just wired up the power (VCC, GND) and plugged the Tx and Rx of the bluetooth module into the Rx and Tx of the Arduino (crossed over so Tx talks to Rx and vice versa). Servo added and the Arduino code updated I can now tilt the camera using some buttons on the BTBotControl interface. A video has been uploaded to YouTube. Overhaul Arduino sketch to allow for joystick control of camera angle (like a pan and tilt mode where horizontal joystick moves will rotate the robot but vertical moves only raise or lower the camera). Perhaps mount an Airsoft BB gun (I have the original one from the tank turret). Write my own custom Android app? 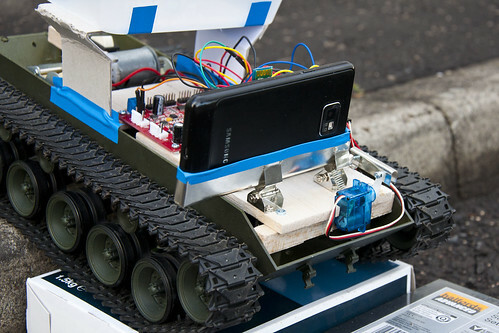 Try piping control of the robot through the on-board Android phone, doing away with the mix of Bluetooth and WiFi. While I’m at it make more use of the Android, it has GPS, an accelerometer etc. Reversing view using phone’s second camera? Phone orientation means the rear-view camera is hidden in the holder. This entry was posted in Arduino, Robot on 26 May 2013 by markcra. My first Digispark project was a hastily thrown-together name badge for the Edinburgh Mini Maker Faire. The badge consisted of a Digispark, an I2C shield, I2C LCD and a SRF02 Ultrasonic Rangefinder. The SRF02 was selected for it’s small form factor and the ability to communicate with it over I2C. Instead of taking up two pins for trig and echo like my other Ultrasonic Rangefinders this allows both the LCD and the rangefinder to share the two I2C pins of the Digispark’s I/Os, leaving me with 4 ‘spare’ pins. Power for the Digispark was supplied by a 9V PP3 battery, though I considered alternatives such as 4x AA batteries, a stack of button cell batteries and a LiPo. The decision was made on a balance of weight and ease of use. The Digispark has a 5V regulator on board, taking any voltage over 6 or 7V and regulating it to the 5V which the three major components require. It isn’t necessary to use the regulator if your power source is going to remain at 5V, hence I considered 4x rechargable AA batteries (1.2V x 4 = 4.8V) unregulated. A mintyboost or similar voltage booster/converter would also have been a viable power supply and would have cut down on weight (I suspect), however I didn’t have the components to hand. Mounting the Digispark, LCD and rangefinder on a simple plexi frame gave the badge a more finished look. With the Digispark prominently displayed (albeit backwards) on the front of the badge I will be able to disconnect it for reprogramming or for showing it off… “oh look at me I’ve got a tiny Arduino”. Software is rather primitive at present. The rangefinder is polled and different messages are displayed according to proximity. At maximum range the LCD is turned off, primarily as a power saving measure. Up close the message will scroll some text. As the LCD is powered by an HD44780 I was able to make use of up to 8 custom characters. I toyed with the notion of producing animations with the custom characters but quickly ran into stack heap collisions so I opted for a few simple graphics. Further custom characters could have been employed by updating the custom characters on-the-fly though they could not all be displayed at once. Further features I would like to (would have liked to – depending on when you read this) include would be a few buttons to choose between different modes/displays. Perhaps some RGB LEDs to liven the display up a bit. 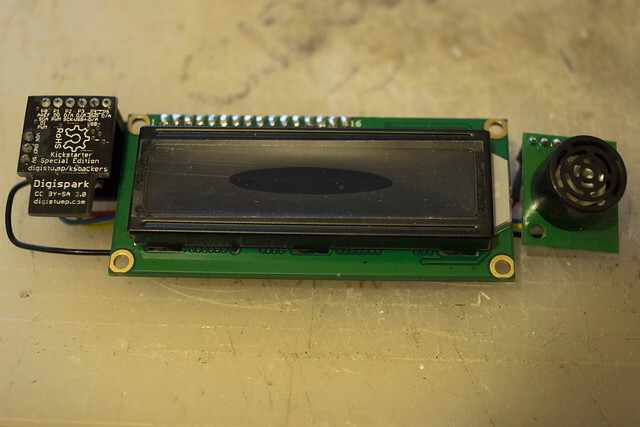 As I thought I might want to re-purpose the LCD I didn’t solder to the pins. Since there wasn’t much space for adding a jumper cable I coiled some single core wire around the pins and covered in heat shrink. Time will tell if this method is robust enough, I may find myself applying a spot of solder if the connection is ‘flaky’. 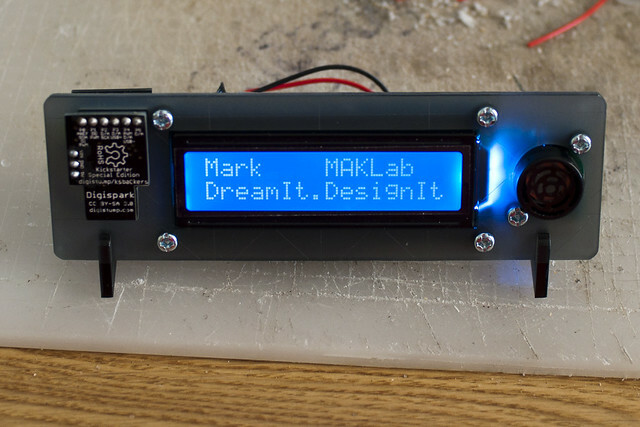 This entry was posted in Arduino on 6 April 2013 by markcra.